Salzburg's Lungau region is a UNESCO protected plateau in the Central Eastern Alps. There are 15 villages in this beautiful area and with the LUNGO ski pass there are 300km of varied skiing in to enjoy. The villages of Sankt Margarethen im Lungau and Katschberg sit at the western end of the Lungau region and both link directly in to the in the Katschberg-Aineck ski area. The traditional Austrian village of Sankt Margarethen sits at the foot of the Aineck on the valley floor and is surrounded by challenging hiking trails. Katschberg, on the other hand, lies at 1640m in a high mountain pass between Salzburg and Carthinia and is surrounded by ski pistes on all sides. With traditional buildings and horse-drawn sledges, Katschberg has a traditional feel but with advanced lift systems and plush local spas there is a welcome modern element here too. Although directly linked to the Grosseck-Speiereck area, Sankt Michael im Lungau sits just a couple of kilometres from Sankt Margarethen and the neighbouring Katschberg ski region. For this reason, Sankt Michael makes a very convenient base for exploring the wider ski area. The village itself is a traditional town with plenty of restaurants, a nearby golfcourse and beautiful surrounding scenery. Also linking into the Grosseck-Speiereck area, the historic market town of Mauterndorf straddles the Taurach river and boasts a wide range of attractions including a medieval castle, Austria's highest narrow-gauge railway and an airfield often used a base for gliding and paragliding. There are a variety of magnificent hiking and biking trails here, rustic Alpine huts, rich history and hearty food. Mariapfarr - "the sunniest place in Austria" - is another popular base in the region with great cross-country skiing (and summer outdoor activites) and easy access to Fanningberg's sunny slopes. With the LUNGO ski pass you can access 300km of skiing in the area via 67 lifts and a comprehensive free bus service. This 300km is spread across 4 main areas; Katschberg-Aineck, Grosseck-Speiereck, Fanningberg & Obertauern. At the western limit of the Lungau Region, on the border between Salzburg and Carinthia, lies the Katschberg-Aineck area. Characterised by high altitude intermediate slopes, there are approximately 70km of ski pistes in this sector mainly focused around the cute hamlet of Katschberg and joining the village of Sankt Margarethen im Lungau up to the Aineck Peak. The Grosseck-Speiereck sector is accessed from the traditional valley villages of Mauterndorf and St.Michael with skiing in this sector stretching up to 2,411m. Primarily red and blue runs with a good range of restaurants, this sector is well varied with a couple of notably long, pleasant descents - including the magical, sunny valley run down to St. Michael (9 km long, 1,350 m drop in elevation). 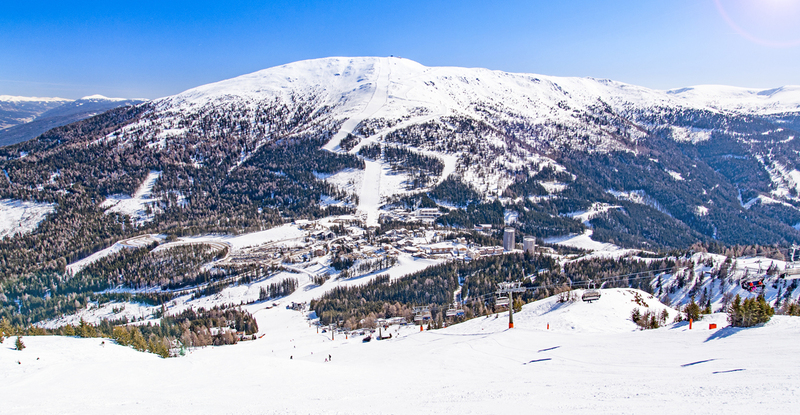 Fanningberg, marketed at primarily at families, has over 30km of sunny pistes and benefits from superb snow conditions. One of the most scenic sectors in the region, Fanningberg is also blessed by a number of rustic ski huts - Gamsstadl at 2,015 in particular - and an 8.5km floodlit toboggan run. Obertauern is also included in the LUNGO ski pass (although not the Lungau SkiRegion Pass), and sits at an impressive 1,740m with around 100km varied skiing above the treeline. A snow-sure village, the scenery here is rugged but impressive, there are good mountain restaurants and modern lifts. The blend of historic landmarks, natural beauty and winter sports across this sunny plateau is impressive and provides a genuine year-round appeal. Hiking and cycling routes wind through this stunning region of the Austrian Alps, linking mountain tarns, rustic huts and stunning views. The Mur Bike Path is particularly popular with families. Highlights for cyclists are bike events such as the “Tour de Mur”. There is also an 18-hole golf course at St. Michael and an airfield for gliding and paragliding above this picturesque landscape. With an enchanting mountain landscape that features lakes, babbling streams, meadows and forests, the Lungau region is a perfect family-friendly holiday location. In addition to a wide range of outdoor sports and activities, including horse-riding, gentle cycle routes and tennis, families will also enjoy the castle and steam railway at Mauterndorf, the adventure park in Katschberg and mini-golf in St. Michael. An impressive collection of 34 apartments with spa facilities, an on-site restaurant and a perfect piste-side location. A new development of 41 apartments in the heart of the Lungau Ski Region, with on-site spa and restaurant and furniture packages included.